Sitting on the lake that separates the main campsite from where the magic of The Big Chill happens, Henry Krokatis’s Helter-skelter lighthouse proved an eye-catching attraction from both sides of the water. The wooden 10-metre-high structure requred painstaking work as Krokatsis painstakingly cut down and sawed discarded floors, broken furniture and wooden off-cuts. Though so obviously a helter skelter due to the slides running about the outside of the tower, the piece shares the architecture of lighthouse and is white too. 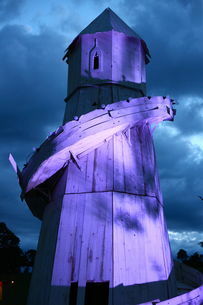 At night this is the side of Helter-skelter lighthouse we see as it was lit up and shimmered on the lake. Krokatis said: “The things that interest me generally are the things that fall between the gaps. I’m looking to make things that have, in a quiet way, a sense of the inexplicable, things that pull us away from logic and rationality towards the realm of visions.” The reflection of the Helter-skelter lighthouse in lake gives the impression of illogical continuation if you were to play on the Victorian-style fairground ride you might find yourself going round more times than expected perhaps in a way Alice gets lost down the rabbit hole in Alice in Wonderland. No one could get near enough to try but children and adults alike would wistfully gaze at Krokatis’s creation throughout the weekend. The second sculpture commissioned by The Big Chill was Claire Morgan who also made her installation very much reliant on its surroundings to give context. 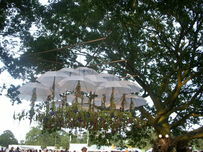 She created a dome ceiling within the canopy of three Oak Trees near the Open Air Stage by suspending natural materials from umbrellas. Morgan describes the shapes of the umbrella canopies as being reminiscent of the sculptural trappings and geometric decorations of the Eastnor Castle interior. This small and secretive installation — you had to hunt for it as there was not an obvious landmark being surrounded by trees — meant if was an intimate feels, offering spiritual protection together with physical protection from the rain. Once when I passed the dome I saw a drum group and dancers add energy to the space, almost cleansing it as at dome kept off bad spirits. Artist Cedric Christie was inspired to start the Blank Canvas project by a charitable initiative staged by Paris film director Jean Luc Godard’s benevolent group “Enfant de Don Quichotte” which donated dozens of tents to the homeless and placed them along the Canal Saint Martin to raise awareness of the plight of the homeless. 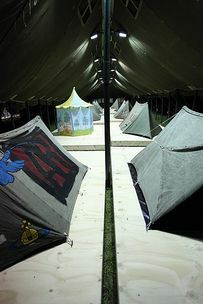 Cedric has used the concept for Blank Canvas Project to create another tent-themed charity project for the homeless. Pup tents have been turned into artwork by famous artists such as Peter Blake, Vivienne Westwood and Neville Brody and each tent will be auctioned individually to raise money for charities raising awareness of the issue of homelessness and displacement around the world.
! (feature_l)http://relayer.s3.amazonaws.com/articles/spreads/4c96498ac1531723a00000e5.jpg!Timothy Han’s Son of lapetus (left) contrasts the solace of a half-open, candle-filled tent with painting on the outside warning of destruction. The safe/unsafe paradox is one perhaps overlooked at festivals: while our tents become our homes, they remain only a flimsy exterior for out comfort within. The pleasure of shielding yourself from the elements can quickly turn to displeasure if the material becomes torn — a frequent occurrence at packed festival campsites. Sir Peter Blake adorned his tent with the definition of the word for Tent, Vivienne Westwood’s The AR Tent showcased the Active Resistance manifesto between our choice to become more cultivated, and therefore more human — or by not choosing, to be the destructive and self-destroying animal. Two artists played with the structure of the tents imaginatively Rogers Stirk Harbour and Partners’ There/Not There placed a think wire red frame for the poles supporting the tent, then arranged the tent cover as though a man is using it as a blanket within the frame — an eerie sit, as if a Big Chiller had got slightly lost when finding his tent one night. Sarah Lucas with her Tent is a Four Letter Word thought more about what to do to the tent rather than use it in its current form: the end result is a tent cover ripped into shards with an odd, deformed pair of what look to be legs. The range of talent on display here was impressive and each tent had been carefully though about. 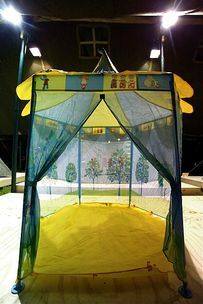 However, you might have been confused by Jake and Dinos Chapman who replaced their military tent with a children’s playtent (below). Photographer Rankin was at The Big Chill – inviting revellers to be part of his museum-scale exhibition Rankin Live! where he will take pictures of 1,000 Britons through the summer in London, Brick Lane and this festival. He conducted a live photoshoot throughout the weekend, meaning many of the crazy outfits worn at The Big Chill may well soon appear in Rankin Live! These art projects, together with the demolition drive-in, Enchanted Garden and a giant zombie who would be burnt on Sunday night with a pyrotechnic accompaniment, ensured there was an exceptionally strong cultural element to The Big Chill, and one no Big Chiller wouldn’t enjoy.